Tesla CEO Elon Musk took to tweets this evening to break the news that the new Autopilot feature “Drive on Navigation” would be pushed to out to the fleet of production vehicles starting tonight. When similar news broke for the release of Tesla’s version 9.0, the release was spread out over nearly two weeks as eager owners helicoptered over their smart devices waiting for a software update notification (including me). 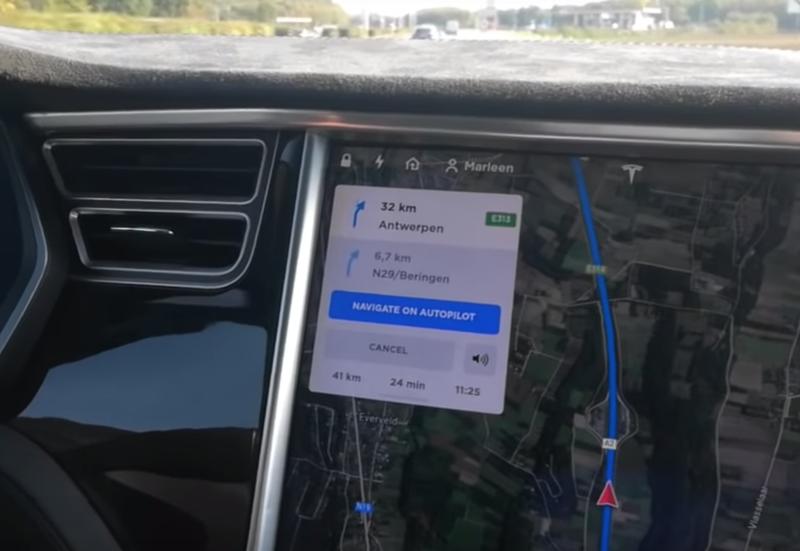 The new Drive on Navigation feature will allow Tesla owners with Autopilot hardware 2.5 and Enhanced Autopilot software to use Autopilot to navigate many of the scenarios commonly encountered on highways, including transitioning from one highway to another, automatic lane changes after driver confirmation, and even taking the exit — as long as the vehicle is following a navigation route in the car’s nav system. The feature will also include the ability to automagically change lanes while on the freeway, though this feature will initially require a confirmation from the driver. Elon clarified the implementation in a response to Jaden Smith that the feature will require the driver to hit the turn signal for the first couple of million miles. Assuming the feature passes the test, the requirement to hit the turn indicator will be removed and the car will just fly along on the freeway towards its destination. Drive on Navigation is the first of the expanded Autopilot features originally slated to roll out with the initial release of version 9.0 but held from the production version at the last minute by Tesla. Personally, a company that holds off on releasing a version of the software that controls the 4,000 pound metal rocket tasked with moving my family and me to the grocery store and back because it might not be safe earns a place on my good side, but maybe that’s just me. When rolled out, the new feature will take Autopilot to the next level and represents a noteworthy step along the path to Full Self Driving. Elon Musk’s greatest blessing and one many around the world claim to be a curse is his aspirational timing for company achievements. What the critics and the pessimists fail to realize is that it is these very same targets that get the team at Tesla fired up to achieve, that get them to strive to accomplish what the world thought to be impossible mere months earlier. In April of 2017, Elon went before the world in a TED talk and proclaimed that a Tesla would drive from Los Angeles to New York without the need for a human to touch the steering wheel before the end of the year, but that failed to happen. At the time, he envisioned that Tesla’s vehicles would be capable of fully autonomous driving in “about 2 years,” and while there is still some time left on that horizon, it does appear that the extended duration of the Model 3’s “Production hell” consumed some of the energy he would have used to push these side projects forward more. Either that or they’re just more difficult for his Autopilot team than expected. Is version 9.0 the start of a renewed public push towards fully autonomous driving for Tesla? If so, we should expect the veritable floodgates of meaningful, impactful software updates coming from the manufacturer over the next few months. That does make its vehicles more attractive and serves to draw in new buyers, but more importantly than that, it means that drivers of Teslas and the cars they don’t hit will be even safer. That means fewer accidents, fewer automotive and pedestrian injuries from cars, and ultimately, fewer fatalities. Safety reigns supreme at Tesla and the renewed focus on Autopilot and Full Self Driving serve to advance that goal. As those updates continue to flow out, it is all the more important that drivers continue to remain vigilant while Autopilot is driving, until Full Self Driving is so much better than a human driver that accidents are all but impossible in a passenger’s lifetime. At that point, Tesla’s shared autonomy fleet will become the go-to service for Transportation as a Service (TaaS), taking the place of services similar to and including Uber and Lyft. Tesla is in a race to the finish against other self-driving technology companies, but what those other companies seem to miss in that debate is that Tesla is already winning that battle. Every car Tesla has sold since October 2016 has been capable of fully autonomous driving … once the software is ready. That gives Tesla the ability to validate its current and future software using data from real cars, driven by real people, in real scenarios. More important than that, having a fleet of hundreds of thousands of autonomous-capable vehicles already out driving around the world means that when the software for fully autonomous driving is ready, all those cars will instantaneously become the largest fleet of autonomous vehicles with the push of a single over-the-air update. That’s bananas, yo. Until then, we’ll have to make do with Drive on Navigation and not let the promise of Full Self Driving get us down. It sounds like a meaningful improvement on the core Autopilot solution and will make Tesla’s vehicles safer and easier to use than they have ever been in the past. Check out the release notes from Navigate on Autopilot from the early-access program below. Our newest Autopilot convenience feature, designed to get you to your destination more efficiently by guiding your car on and off the highway. Navigate on Autopilot intelligently suggests lane changes to keep you on your route in addition to making adjustments so you don’t get stuck behind slow cars or trucks. You can enable Navigate on Autopilot by going to Controls > Autopilot and first enabling Autosteer. For each route where Navigate on Autopilot is available, you have the option of enabling the feature by pressing the button located in the Navigation Turn List.